The real adventure begins when our gear is loaded into 4X4s for the 20km journey to the start of the trek. The Pemon people manage the trail and will hire us the guides and porters we need though it takes over an hour to manage this transaction due to the large number of banknotes involved. It gives me time to look around. The first days walk is allegedly moderate (though it doesn’t feel that way) and takes us to the isolated Tek river camp where we can wash away the sweat in the icy river and enjoy Manuel’s tenderloin steaks prepared over an open fire – there really are advantages to bringing a guide who runs his own French restaurant. Conversation over dinner is limited and none of us have much energy after 8pm. The following morning, the temporary latrine outside the camp affords undoubtedly the best view I have ever enjoyed from a kludge. The prospect of Roraima rises like a sandstone fortress out of the plains. The clouds cling to its flat roof and high waterfalls form splashy horse’s tails as the rainwater spills over the sides. A steady day’s climbing brings us to base camp and a chance to rest and wash some underpants in a very gritty river (not advised). 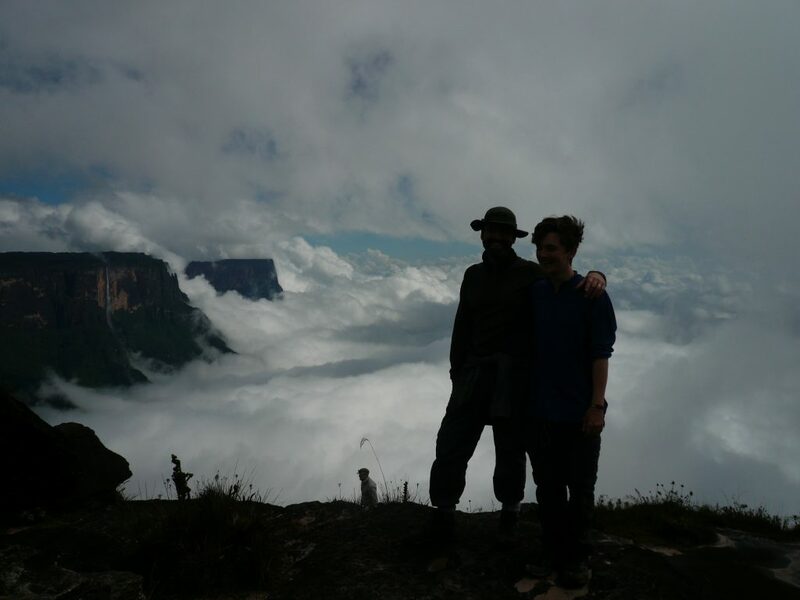 We are now frighteningly close to the mountain – to call Roraima sheer sided is no exaggeration. The sandstone cliffs rise out of the rainforest absolutely vertically, streaming with water and completely unclimbable (many professional climbers have tried and failed utterly). Fortunately for us Roraima is one of the few mountains that has an accessible trail to the summit although from here it ascends sharply at a 45 degree angle and looks about as accessible as Kim Jong-un’s private bathroom. It’s not difficult to see why the Pemon regard these mountains as sacred and the home of the Gods/ Nor is it difficult to see why explorers like Percy Fawcett might have speculated about the strange creatures that live on the top in such an isolated eco-structure (an idea that gave rise to Conan Doyle’s 1912 ovel, ‘The Lost World’). Tomorrow some of these mysteries might be revealed but for now I’m content to believe that there might just be dinosaurs.